Many Rajans have served in the armed services in the past and present. They are ordinary people with simple motives – honor, duty, and love for the country. These brave Rajan patriots have been safeguarding freedom and territorial integrity of the island nation for generations. They and their families - parents, wives, and children - have made great sacrifices to Sri Lanka. Since Flight Lt. A.F. Kularatne, who in 1942 during the height of World War II, went Missing In Action after running a series of daring successive bombing raids into Nazi Germany, few dozen commissioned and non-commissioned Rajans have paid the supreme sacrifice in the line of duty. While we grieve for them, we know that they are immortal. At the end, the nation prevailed and stays united. We recognize that we peacefully sleep in our beds at night knowing our families back home are safe only because of the heroic sacrifices of these brave men who helped liberate the country from terrorism. We feel honored and privileged to have one Rajan war hero as a DAANA member. 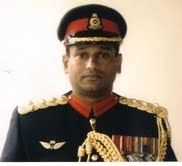 Brigadier Nirmal Dharmaratne, the special forces commander during the recent decisive battles, who is currently residing in Washington area on an official assignment. We invited Brig Nirmal to join with a Question and Answer session with DAANA members. Brigadier Nirmal Dharmaratne attended Dharmaraja College from 1973 to 1984 where he excelled in rugby, soccer and cadetting. He was the captain of the school rugby team in 1984 and won college colors for rugby, soccer and cadetting. He was the Special Forces Commander until March 2009. Then he was appointed as the Defense adviser to the Sri Lankan High Commission in London until October 2010. Since then he is the Director Operations in SL Army. Currently, he is residing in US with his family on an international fellowship at the National Defense University in Washington DC. Q1) You have been active in co-curricular activities at school (cadetting, rugby etc.). As someone who had spent a considerable time outside the class room, and who had started the professional career right after the school, how much you value the experience that you gained from co-curricular activities to shape your chosen career? I believe that as a student one should not engage only in studies but should also involve in numerous other activities as much time and opportunity permit, in order to gain a varied experience in life. Having said that, I do honestly admit that I had to strive later in my life to regain the classroom time I missed at school, due to non-academic activities. Therefore, I do not recommend anyone attending co-curricular activities at the cost of studies. Nevertheless, the competent skills I developed through co-curricular activities benefited me immensely, particularly leadership skills, self-confidence, team skills and so on. In the military, where you always work with and through others, such experiences count. Also my work environment is such that I need to possess such skills, so much so the professional knowledge. Q2) What are the memories of your school life? Especially as a cadet. I left the school in 1984 with a lot of good memories; however with the passage of time most of those memories have faded away from my mind. But I can still recollect some of those which are unforgettable. Becoming the runners-up in the ‘Herman Loose’ Cadeting championship in 1982 in which I participated, was remarkable. Defeating Royal College in rugby in 1981 was exceptional. Q3) Any message for current DRC students? Q4) You captained the school rugby team in the 80s – that was an era when Kandy Sports Club (KSC) was sitting in the bottom of the league. Yet, the school managed to produce two SL national team captains during that period. Now the KSC standards may be similar to those of the national team and probably young players find it difficult to find a place in the club. So the question is, do you think that the rise of Kandy rugby has been beneficial to school rugby in Kandy, or young Kandy school players have been deprived the chance to play for the club? As I saw it, Kandy schools continued to produce high quality players ever since Rugby started at Kingswood College over 100 years ago. The club's performance declined in late 80s and early 90s. The main reason for this was the fact that most of the good players the Kandy schools produced were forced to relocate in Colombo and elsewhere due to their jobs. The transformation came in late 90s with the creation of job opportunities for these players in their hometown Kandy, mainly in the garment industry, and the introduction of professional rugby where players were contracted to the club. This helped retaining of players in the club and the performance increased tremendously. Apart from this the club administration was capable of attracting good players from outside Kandy who joined the club to play professional rugby. Eventually the performance of the club rose from leaps and bounds, so were the performance of Kandy schools, because a competition arose amongst the school players to perform well to be selected to play for this most popular club. Radhika and Indrajith were two of the many outstanding players the College produced. I would agree with your point that it is hard for an up-and-coming player to get selected to the club due to the increased competition. The newly raised 'Upcountry Lions' club will hopefully provide more opportunities for them. Q5) What was your most difficult day in the battlefield? There were many difficult situations I have faced in battle; however, the Jaffna Fort rescue operation in 1990, the attack on Suganthan LTTE base in Mullativu jungles in 1991 and the counter attack close to Puthukudiruppu in February 2009 to recapture a lost territory were some of the most crucial ones. In the first two occasions I was in command of a Squadron of Special Forces and on the third occasion I was in command of the Special Forces Brigade. I pay tribute to the valiant soldiers who fought along with me. Q6) Armed forces recruited heavily during and especially at the end of the war and most of those members are still in active duty. Now that the war is over how does the army keep them engaged and motivated? Also what type of activities do they take part in a non-war situation? Army has enormous amount of resources which include manpower, material, knowledge and skills. During peacetime and particularly during post-insurgency situation an army is normally employed to assist civil authorities, which is exactly happening at present as far as our Army is concerned. Training to maintain readiness and preparedness while reorganizing and restructuring to cater for the current challenges are at the top of the priority list of the Army. Q7) Though the war is over, the security threats cannot be ruled out. All efforts to dispel the hard-earned peace should be avoided. How is it done at the current time? A weak military, a weak government, a weak nation cannot win a war. Therefore, all Sri Lankans must know that we are a strong nation which won the war having an unwavering political will and a sound military strategy executed by professional armed forces. Such professionalism should be maintained and complacency should be avoided. Learning form the past, correctly assessing the possible threats to national security (both internally and externally) and comprehension of the same by all higher level decision makers will help countering any threats before they manifest and avert another conflict in the country. Q8) There were lot of casualties during the war and there are lots of soldiers with different disabilities even at current time. What is the mechanism in place to look after them and their families and how can the public support those efforts? Can we be satisfied with the welfare of disabled veterans? Yes, thousands of soldiers were wounded and majority is living with different degrees of disability. The Ministry of Defense and the Army have invested considerably to look after these people. The wounded men are rehabilitated medically, socially, mentally and physically. These include treating of injuries and PTSD (Post Traumatic Stress Disorder) cases by the army medical personnel as medical rehabilitation, organizing social activities for social rehabilitation, counseling, etc. for mental rehabilitation and exercises, games and so on for physical rehabilitation by the other trained staff. The Army has a separate well-structured organization to handle these responsibilities which is supervised by the Adjutant General with the assistance of the Directors for Rehabilitation, Medical and Veteran’s Affairs. Adequate infrastructure facilities too are available for the same. The resource centers such as Mihindu Seth Medura at Aththidiya, Ranaviri Apparels at Yakkala, Physical Rehabilitation Centre in Ambepussa and Abhimansala, wellness resorts in Anuradhapura & Matara are few, they provide professional service to wounded soldiers in all forms of rehabilitation. These are on par with international standards hence the well-being of the partially abled soldiers is adequately taken care of. Q9) There was a huge support from the general public and even from the diaspora like us here in US towards the armed forces. Still people remember them with gratitude. How do you and the army feel to receive that kind of support from people when you are engaged in a deadly war? Public support was one of the key factors to the success of the campaign. Soldiers never felt that they were isolated. They took pride of the fact that their sacrifices were being appreciated by the nation. Huge public support raised the morale of the troops and motivated them to fight till the end. Q10) Are the LRP (Long Range Patrol) and Special Forces the same? We have heard about 8-member teams trekking the jungle behind the enemy lines, at times, for about 50 miles on special missions. Did they have safe houses or what level of technology did they use? We read about a US team 6 operation in Pakistan which the president, VP and secretaries of defense and state and many senior commanders watched during the entire mission from the WH. Do we also use such sophisticated aerial surveillance/advanced technology etc., or just the radio in LRP missions? Just tell anything that you can share with us, on LRP mission planning? LRP (Long Range Patrol) troops are the elites among the elites. They are a part of the Special Forces. They are highly trained, multiple skilled and finest combatants. Their method of operation is somewhat unconventional and clandestine in nature. They are self-contained, self-sufficient and operate way behind the enemy lines in very small numbers for extended periods. They augment their operational capabilities using advanced technology such as latest navigational aids, satellite communication systems and remote controlled devices, etc. They DO NOT operate from safe houses, but from hides and sustain on caches. Their missions are usually authorized at very high level due to the high level of risk involved and the strategic impact of the outcome. Q11) Why did you decide to join Sri Lankan military? During the period of my final days at school there were three professions popularly chosen by school leavers. First one was the executive post in the private sector, second was the police officer and the other was the commissioned officer in the armed forces. During that time, unlike nowadays, a good majority of school leavers looked for employment while a few others chose to pursue higher education. As for me, having done Cadetting at school I began to adore the uniform, therefore, I had a great desire to become a commissioned officer in the Army. Q12) What is your current role and what is your mission in US? Along with military officers of 53 other countries including the United States, I am reading for a Master’s Degree in National Security and Resource Strategy at the Eisenhower School of the National Defense University, which is the premier military education institute in the United States. Q13) Now that the war is over. Hollywood would have produced a dozen blockbusters. Those LRP missions or heroic actions of those behind each Parama Weera Vibhushanaya award will be great movies. In order to keep the memory of heroic actions alive, do you think that the ministry of defense should encourage or work with Sri Lankan film industry? Certainly a good idea. Film-making based on true stories is another way of recording history. But it should be done professionally, as realistically as possible, not merely for commercial value. - Thank you very much Brigadier Dharmaratne, we wish you and your family Good Luck, Good Health and Happiness !